"On the eastern side of the Sierra Nevada mountains, both California and Nevada, the weather can change dramatically within minutes. 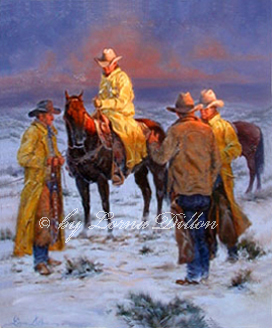 While there is snow on the ground and dark sky behind them, these cowboys are standing in early morning light. But they know it can be a raging rain or snow storm within an hour and a slicker will be all that is between them and wet!"